Hello everyone! 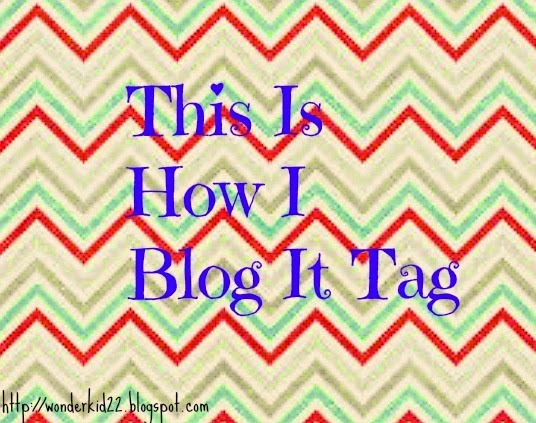 Instead of doing the 30 Day Blogging Challenge, I'm going to try out another tag! YAY! I'll tag people and then whoever else wants to do it can. The tag is simple, I ask a few question about how YOU blog and you answer! Its fun to see how people blog. I'll even answer my own questions! Do you blog in: quiet areas, or loud areas? I normally blog in loud areas. If the house is too quiet, I'll put on some music. How would you describe your blog? A book blog, fashion blog, etc. I would describe mine as a craft/lifestyle blog. A little mix of everything! Long posts, short posts, or somewhere in the middle? When you first started your blog, what did you think? When I first started, I thought I was never going to get any readers. I thought I was boring and that my blog was hopeless. Not so positive, huh! How do you think your blog is going to be like in the future? I think my blog is going to be pretty popular, that's all I can say! Once we do the tag and tag people, do we ask them new questions about how they blog or do we ask the same questions? Thanks, for both answering and tagging me! 1. Simple colors because they are relaxing, I think, but bold colors are cool too!! 3. I would describe my blog as a crafts and recipes blog, I think. 4. Long posts about me, shorter posts about recipes and other stuff. 5. When I first started my blog, I thought it wasn't going to get any views. 6. I think my blog is going to be really popular! :D I hope! Cool! I'm sorry, but I don't have a blog, yet. 1. Bright Colours! Usually purple or violet to match the name of my blog. 2. Loud areas. I usually switch the TV on. 3. A bit of everything: Lifestyle, reviews, opinions. 4. I guess medium length posts, so readers wouldn't get bored. 5. I actually thought I would blog on a schedule, every other day, but that didn't work out at the beginning.